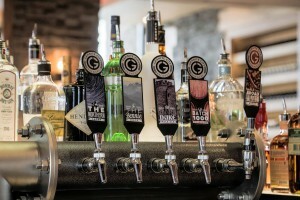 Granite City Food & brewery offers what we believe is the best beer on tap in Detroit. We offer a wide selection of craft beer on tap at all of our locations, including Detroit. Whether it’s an oatmeal stout made with hints of chocolate and coffee or the hoppy taste of a Double IPA, Granite City has a great variety of tasty craft beer on tap in Detroit. If you would like to learn more about our selection of craft beer on tap in Detroit, please call Granite City Food & Brewery today at 313-309-9120. You can also get in touch with one of our knowledgeable representatives by submitting an online request form simply by filling out the form on the right side of this page. Granite City has a unique method of brewing that ensures all of our beer on tap is made fresh. Our unique brewing method is called Fermentus Interruptus™ which makes micro brewing for multiple locations more efficient. Our fresh beer on tap in Detroit tastes so great because we take the wort shipped in from our central brewing facilities and ferment them on-site at every Granite City location. All of our craft beer on tap goes through this process to ensure that you’re drinking only the freshest beer at Granite City in Detroit. Granite City always has a wonderful selection of signature and seasonal craft beer on tap in Detroit. We have our popular signature beer on tap at all locations year-round and a new seasonal beer every month. We offer flights of our signature and seasonal beers so that you can see which beer you enjoy the most. Stop by Granite City in Detroit today and see what great craft beer we have on tap. To earn more about our beer on tap in Detroit, please contact Granite City at 313-309-9120. To submit an online request, simply fill out the form on the right side of the page and a knowledgeable representative will be with you shortly.